Add only $5 per 50 pound box for anywhere in the rest of the country including Alaska and Hawaii ! This will be the easiest and most economical way to order your clay for most orders under 1000 pounds. Please give us a call toll free at (888)774-2529 for quote on larger quantities. For regular "in Store Pickup" Clay pricing Click here. #113000 Ben's Mix White Stoneware: Porcelain / Stoneware a new Helmer kaolin based clay body which is showing exceptional results in wood firing at cone 10+. Fluxes ash nicely so it looks fantastic unglazed or with Shino in reduction. 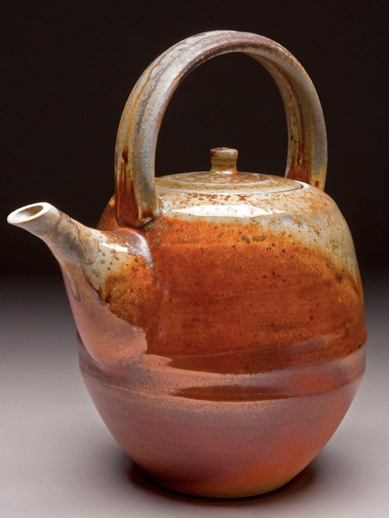 "That teapot's color came solely from the wood ash and reduction in Tony's Moore's kiln - ... nothing was applied to the exterior - no glaze, no flashing slip, no soda, no nothing. 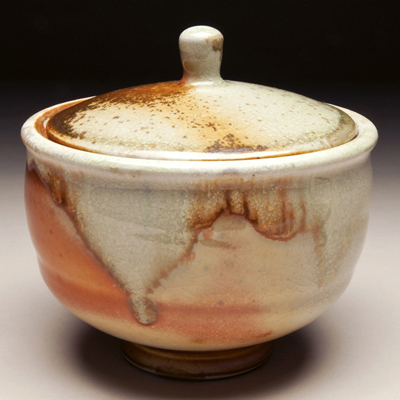 The inside was lined with Charlie White, so there wasn't even any bleed through of soda from a shino liner glaze. .... pretty amazing when it came out of the kiln - a gift from the fire gods!" Lidded bowl above and below : Ben's Mix "with just a little bit of Charlie White on the very lip of the rim (and as a liner glaze) Otherwise it was naked on the outside"
Fired in the kiln of Tony Moore. Read about Tony and his Hybrid Anagama-Norborigama Wood-Fire Kiln here. It has a little stoneware clay but much more of the air-floated kaolin so this body throws like a porcelain not like a stoneware. It's not quite as short as a pure grolleg porcelain but still very little tooth. It has great flashing results in wood because of the high percentage of Helmer. This clay is not recommended for beginners.